Berkeley -- The fossilized skulls of two adults and one child discovered in the Afar region of eastern Ethiopia have been dated at 160,000 years, making them the oldest known fossils of modern humans, or Homo sapiens. The skulls, dug up near a village called Herto, fill a major gap in the human fossil record, an era at the dawn of modern humans when the facial features and brain cases we recognize today as human first appeared. The fossils date precisely from the time when biologists using genes to chart human evolution predicted that a genetic "Eve" lived somewhere in Africa and gave rise to all modern humans. "We've lacked intermediate fossils between pre-humans and modern humans, between 100,000 and 300,000 years ago, and that's where the Herto fossils fit," said paleoanthropologist Tim White, professor of integrative biology at the University of California, Berkeley, and a co-leader of the team that excavated and analyzed the discovery site. "Now, the fossil record meshes with the molecular evidence." "With these new crania," he added, "we can now see what our direct ancestors looked like." "This set of fossils is stupendous," said team member F. Clark Howell, UC Berkeley professor emeritus of integrative biology and co-director with White of UC Berkeley's Laboratory for Human Evolutionary Studies. "This is a truly revolutionary scientific discovery." Howell added that these anatomically modern humans pre-date most neanderthals, and therefore could not have descended from them, as some scientists have proposed. The international team is led by White and his Ethiopian colleagues, Berhane Asfaw of the Rift Valley Research Service in Addis Ababa, Ethiopia, and Giday WoldeGabriel of Los Alamos National Laboratory in New Mexico. The results of the find will be reported in two papers in the June 12 issue of the journal Nature. The research team also unearthed skull pieces and teeth from seven other hominid individuals, hippopotamus bones bearing cut marks from stone tools, and more than 600 stone tools, including hand axes. All are from the same sediments and, thus, the same era. "These were people using a sophisticated stone technology," White said. "Using chipped hand axes and other stone tools, they were butchering carcasses of large mammals like hippos and buffalo and undoubtedly knew how to exploit plants." They lived long before most examples of another early hominid, the neanderthal, or Homo neanderthalensis, proving beyond a reasonable doubt, White said, that Homo sapiens did not descend from these short, stocky creatures. More like cousins, neanderthals split off from the human tree more than 300,000 years ago and died out about 30,000 years ago, perhaps driven to extinction by modern humans. "These well-dated and anatomically diagnostic Herto fossils are unmistakably non-neanderthal," said Howell, a co-author of the Nature paper that details the hominids and an expert on early modern humans. "These fossils show that near-humans had evolved in Africa long before the European neanderthals disappeared. They thereby demonstrate conclusively that there was never a neanderthal stage in human evolution." Because the Herto fossils represent a transition between more primitive hominids from Africa and modern humans, they provide strong support for the hypothesis that modern humans evolved in Africa and subsequently spread into Eurasia. This hypothesis goes against the theory that modern humans arose in many areas of Europe, Asia and Africa from other hominids who had migrated out of Africa at a much earlier time. The fossil evidence, said Asfaw, "clearly shows what molecular anthropologists have been saying for a long time - that modern Homo sapiens evolved out of Africa. These fossilized skulls from Herto show that modern humans were living at around 160,000 years ago with full-fledged Homo sapiens features. The 'Out of Africa' hypothesis is now tested, ... (and) we can conclusively say that neanderthals had nothing to do with modern humans. They went extinct." The three fossil skulls remain in Ethiopia, but replicas made from them were compared by the research team with many examples of neanderthal and earlier hominid skulls, as well as those of modern humans. Many of the modern human comparison skulls came from a worldwide sample of skeletal remains in the collection of UC Berkeley's Hearst Museum of Anthropology. The most complete of the three new fossil skulls, probably that of a male, is slightly larger than the extremes seen in modern Homo sapiens, yet it bears other characteristics within the range of modern humans - in particular, less prominent brow ridges than pre-Homo sapiens and a higher cranial vault. Because of these similarities, the researchers placed the fossils in the same genus and species as modern humans but appended a subspecies name - Homo sapiens idaltu -to differentiate them from contemporary humans, Homo sapiens sapiens. Idàltu, which means "elder" in the Afar language, refers to the adult male's antiquity and individual age. The man, though probably in his late 20s to mid-30s, had heavily worn upper teeth and a brain size slightly larger than average for living people. Scientists tracking evolution through changes in mitochondrial DNA, which is passed from mother to daughter, have estimated that humans derive their mitochrondrial genes from an ancestral mother nicknamed "Eve" who lived in Africa about 150,000 years ago. Other scientists studying the male Y chromosome have reached similar conclusions. The new Herto fossils are from a population living at exactly this time. "In a sense, these genetic findings were impossible to seriously test without a good fossil record from Africa," said White. "Back in 1982, when Becky Cann and Allan Wilson of UC Berkeley were using molecules to study evolution, they concluded that the common ancestors of all modern humans lived in Africa 100,000 to 200,000 years ago. For the last 20 years we've been looking for good, well-dated fossil evidence of that antiquity." Previously found fossils were younger, from sites scattered around Africa, often poorly dated and incomplete. These include fossil skull fragments from Klasies River Mouth in South Africa, dating from about 100,000 years ago, and Middle Eastern fossils from Qafzeh and Skhul dating from 90,000 to 130,000 years ago. Ethiopia has yielded some modern human fossils, including those from Omo, which are approximately 100,000 years old, and the Aduma fossil finds of the Middle Awash, which date from about 80,000 years. While these previous discoveries appear also to be Homo sapiens, the new finds from Herto are older, well-dated and more complete without sharing characteristics of more primitive human ancestors such as Homo erectus or the neanderthals. The fossil-rich site was discovered on Nov. 16, 1997, in a dry and dusty valley bordering the Middle Awash River near Herto, a seasonally occupied village. During a reconnaissance, White first spotted stone tools and the fossil skull of a butchered hippo emerging from the ground. When the team returned to intensively survey the area 11 days later, they discovered the most complete of the adult skulls protruding from the ancient sediment. It had been exposed by heavy rains and partially trampled by herds of cows. A portion of the large adult's left front cranium (the braincase) had been crushed and scattered, but the team was able to excavate the rest of the skull, minus the lower jaw, and reconstruct it. The child's skull, found nearby, was fragmented and scattered from having been exposed for many years. The team recovered most pieces of the cranium, more than 200 in all, from a 400 square-foot area, and Asfaw painstakingly pieced them together over a period of three years. Based on the presence of unerupted teeth, the skull is that of a child of six or seven. Interestingly, this skull and a second adult's, too fragmentary to reconstruct, showed cut marks pointing to ancient mortuary practices, White said. The child's skull bore marks indicating that, after death, the muscles had been cut from the base of the skull. The rear of the cranial base was broken away and the edges polished, and the entire cranium was worn smooth as if by repeated handling. The second adult skull showed parallel scratches around the perimeter of the skull apparently made by a stone tool repeatedly drawn across the skull's surface in a pattern different from that created during defleshing, as for food. Even the nearly complete adult skull had a few cut marks. The mortuary rituals of the Herto people differ from those of earlier hominids, some of whom cut flesh from skulls but apparently did not polish or decorate them with scratch marks. Modifications like those seen in the Herto skulls have been recorded by anthropologists from societies, including some in New Guinea, in which the skulls of ancestors are preserved and worshipped. The Herto skulls were not found with other bones from the rest of the bodies, which is unusual, White said, leading the researchers to infer that the people "were moving the heads around on the landscape. They probably cut the muscles and broke the skull bases of some skulls to extract the brain, but why, whether as part of a cannibalistic ritual, we have no way of knowing." The team also recovered more than 640 stone artifacts, though they estimate that the entire Herto area contains millions of such artifacts: hand axes, flake tools, cores, flakes and rare blades. Renowned African prehistorian J. Desmond Clark of UC Berkeley analyzed many of them before his death in February of last year. Clark and colleagues Dr. Yonas Beyene of Ethiopia's Authority for Research and Conservation of the Cultural Heritages and Dr. Alban Defleur of Marseilles, France, concluded that the stone tools were transitional between the Acheulean period, characterized by a predominance of hand axes, and the later flake-dominated Middle Stone Age. "The associated fossil bones show clearly that the Herto people had a taste for hippos, but we can't tell whether they were killing them or scavenging them," said Beyene. "These artifacts are clues about the ancestors who made them." The early humans at Herto lived along the shores of a shallow lake created when the Awash River temporarily dammed about 260,000 years ago. The lake contained abundant hippos, crocodiles and catfish, while buffalo roamed the land. The sediments and volcanic rock in which the fossils were found were dated at between 160,000 and 154,000 years by a combination of two methods. The argon/argon method was used by colleagues in the Berkeley Geochronology Center, led by Paul R. Renne, a UC Berkeley adjunct associate professor of geology. WoldeGabriel of Los Alamos National Laboratory and Bill Hart of Miami University in Ohio used the chemistry of the volcanic layers to correlate the dated layers. The Middle Awash team consists of more than 45 scientists from 14 different countries who specialize in geology, archaeology and paleontology. In this single study area, the team has found fossils dating from the present to more than 6 million years ago, painting a clear picture of human evolution from ape-like ancestors to present-day humans. 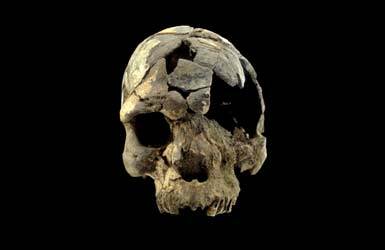 "The human fossils from Herto are near the top of a well-calibrated succession of African fossils," White said. "This is clear fossil evidence that our species arose through evolution." The work was funded by the National Science Foundation and the Institute of Geophysics and Planetary Physics at Los Alamos National Laboratory, in combination with the Hampton Fund for International Initiatives of Miami University and the Japan Society for the Promotion of Science.